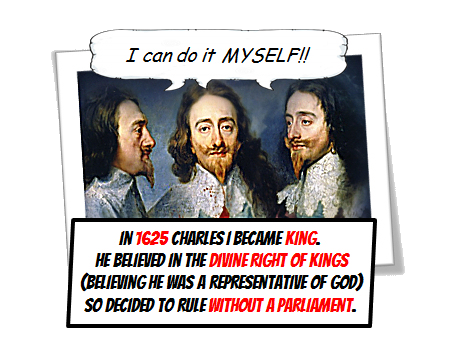 In 1625 Charles I became king. He believed in the Divine Right of Kings (believing he was a representative of God) so decided to rule without a Parliament. 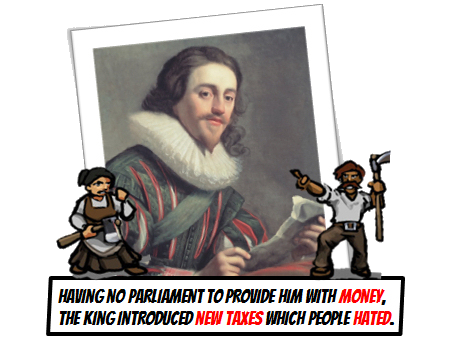 Having no parliament to provide him with money, the king introduced new taxes which people hated. 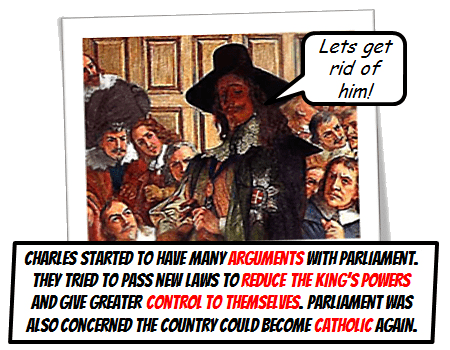 Charles started to have many arguments with parliament. They tried to pass new laws to reduce the kings powers and give greater control to themselves. Parliament was also concerned the country could become catholic again. 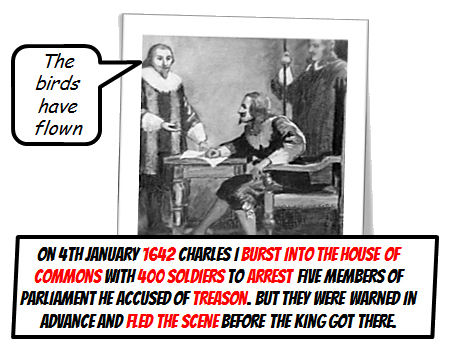 On 4th January 1642 Charles I then burst into the House of Commons with 400 soldiers to arrest five Members of Parliament he accused of treason. But they were warned in advance and fled the scene before the king got there. 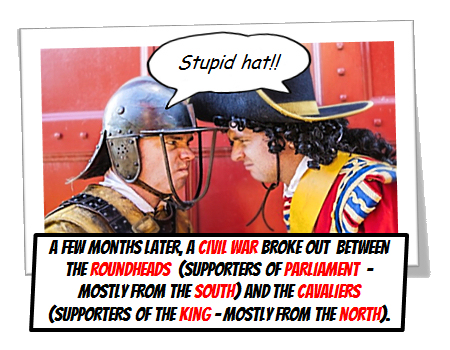 A few months later, a civil war broke out between the Roundheads (supporters of Parliament – mostly from the south) and the Cavaliers (supporters of the king – mostly from the north). 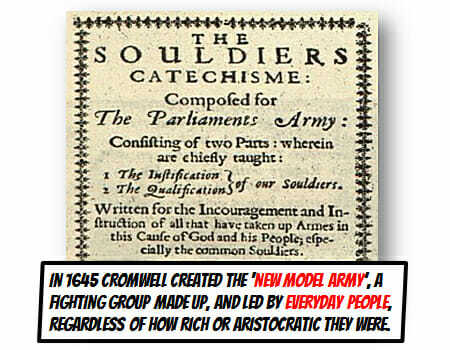 In 1645 Cromwell created the ‘new model army’, a fighting group made up, and led by everyday people, regardless of how rich or aristocratic they were. 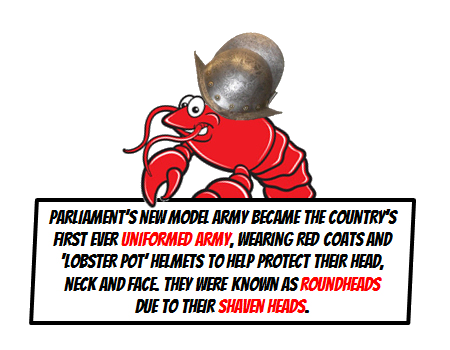 Parliament’s new model army became the countries first ever uniformed army, wearing red coats and ‘lobster pot’ helmets to help protect their head, neck and face. They were known as roundheads due to their shaven heads. 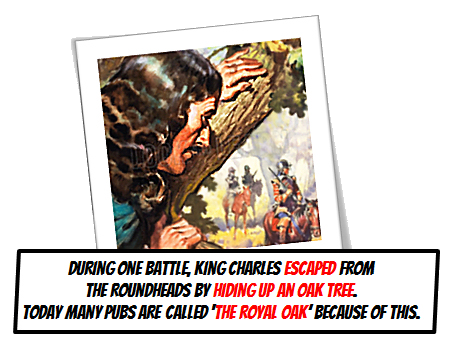 During one battle, king Charles escaped from the roundheads by hiding up an oak tree. Today many pubs are called ‘the royal oak’ because of this. 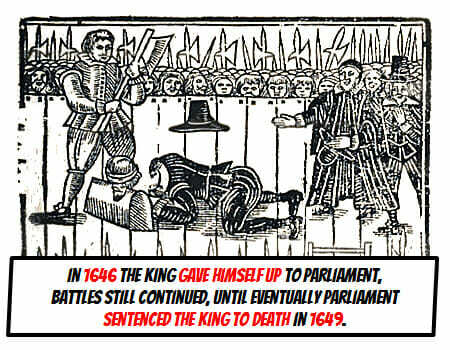 In 1646 the king gave himself up to parliament, battles still continued and eventually parliament put the king himself on trial and he was sentenced to death on a cold January morning in 1649. 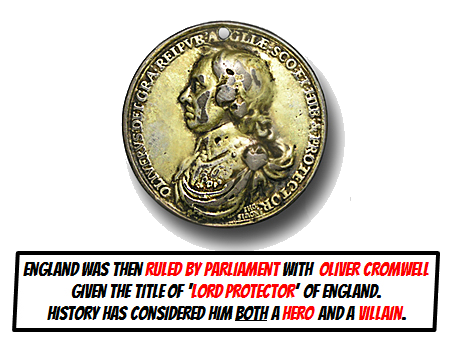 England was then ruled by Parliament with Oliver Cromwell given the title of ‘lord protector’ of England. History has considered him both a hero and a villain. 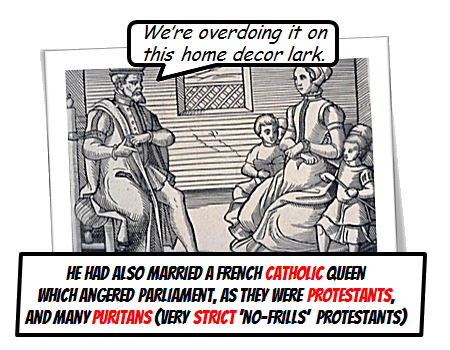 Cromwell was a strict puritan, leading a pure and simple life. 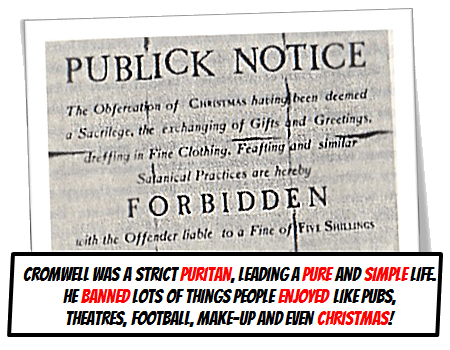 He banned lots of things people enjoyed like pubs, theatres, football, make-up and even Christmas! 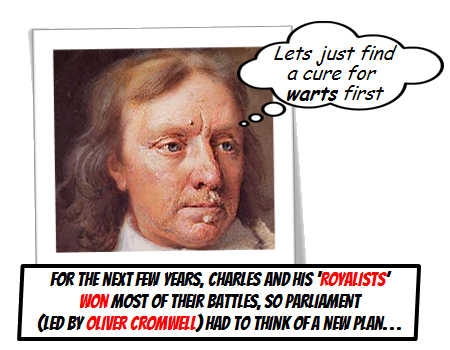 People became sick of Cromwell’s rule and after his death the son of King Charles I was invited back to become the new king Charles II. Known as the restoration of the monarchy. 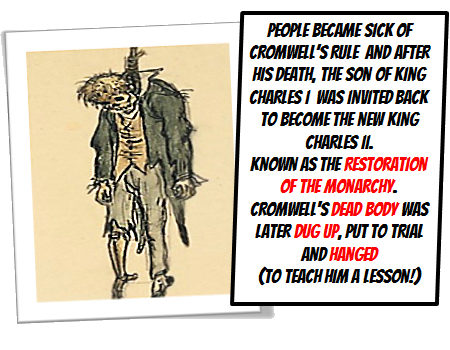 The dead Cromwell’s body was later dug up, put to trial and hanged. 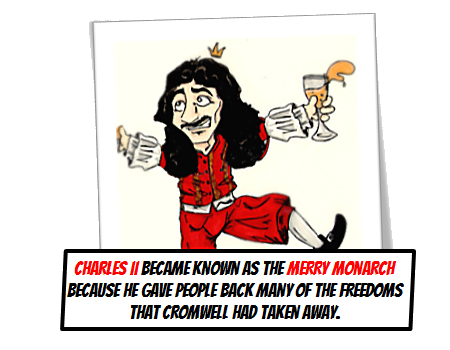 Charles II became known as the Merry Monarch because he gave people back many of the freedoms that Cromwell had taken away. 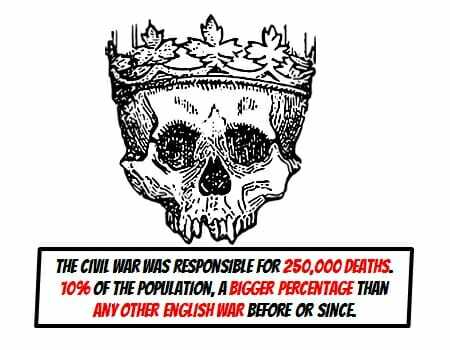 The English civil war was responsible for 250,000 deaths. 10% of the population, a bigger percentage than any other war before or since.